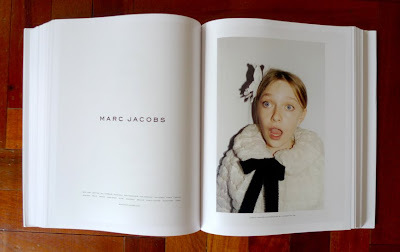 i finally, FINALLY got the juergen teller marc jacobs book i ordered a YEAR ago, it got sent to tsent to my old job, then i was on the ROAD, then fedexed here, etc etc..so here, here it is. yesssssssssss! STEPHEN MALKMUS! can we bring together any more of my favorite things in one place, MABES NOT POSS. dakota fanning, such an epic moment. supposedly they made the whole collection tinysized for her for this. ps, this book is about ohhhh ummm 400 pounds? dannnngggggg. I think I have torn out most of these from magazines, but I still NEED this, obviously. one of the most perfect collaborations ever! ps juergen teller has a show opening at lehmann maupin september 10. it's going to be amazing. Oooooh, swoon! Loving this big time. Marc Jacobs is my fashion God.